Are your sales habits good ones? It’s always good to get back to the fundamentals of good selling. At Pipedrive, we’re great believers in getting the basics right. For veteran salespeople, we hope this guide will help you remember what made you an awesome salesperson in the first place; conversely, it might help you discover some reasons why you’re still struggling despite your experience. Look at changing your habits if they’re not working. To those entering the sales world, our hope is that we’ll help you start off with the solid fundamentals that you can build a career on. Follow this advice and develop sales habits that will help you regularly close deals. The fundamentals of selling: Someone is looking to improve their life and you want to help them see why your product is the one that will help them make that improvement. The problem is that, when it comes to making decisions, humans are excellent at creating complications. This is understandable when it comes to lengthy sales cycles that may involve a high number of customer ‘touches’ or services. A salesperson is someone who has the responsibility of guiding a buyer through the complexities of decision-making. This may involve many stages of back-and-forth, repositioning, and micro-decisions that trigger new stages of the selling process. This is where the sales pipeline comes into its own. A sales pipeline is an organized, visual way of tracking multiple potential buyers as they progress through different stages in the purchasing process. Chances are, you already use the fundamentals of a sales pipeline, even if you’re unaware of it. If your sales process has multiple stages — “Call client,” “Meet with client,” “Send proposal,” “Final meeting,” “Deal signed” and “Deal declined” — you’ll find the move to a pipeline-centric sales management tool easy and logical. When used correctly, a sales pipeline is a huge help in bringing predictability to your sales efforts. It gives you a visual overview of your business at any one time, allows you to forecast revenue and eliminates the stress of feeling disorganized. If you’re already using CRM software to manage your sales, a good practice is to revisit your setup and rules – data is easy to transfer should you find the need to switch. CRMs typically get customized again and again. While this evolution may be natural, it easily can result in a system that becomes overly complicated. Before further customization, it’s useful to consider revisiting how your CRM is delivering the fundamentals we discuss in this article. Since Pipedrive’s launch in 2010, many of our competitors have introduced the sales pipeline to their products. Whatever your product, it’s important to realize what you want to get done, and how you want the product to help you. While fancy graphics and flashing lights may be appealing, it’s important to confirm if a salesperson is likely to benefit from using the CRM of your choice. Does your CRM help salespeople focus on activities? We believe a sales tool should help you sell better, not be used as 'big brother.' Only then can companies be successful. So should you stop reading if you don’t wish to use Pipedrive? No, not at all. The fundamentals we’re talking about here are system agnostic so any salesperson will benefit. Where to start? Who do you want to talk to? In the beginning, all you have are people (contacts) you think would like to buy your product. If there are a lot of them, you will need something to help you manage not only those contacts, but also your interactions with them. An easy way to do this is to use a spreadsheet tool such as Google Sheets or Excel. Of course, a dedicated sales CRM also works, but some may find it daunting to dive right into that. This is a great way to become acquainted with the basics of managing a sales pipeline. Using a template like this makes perfect sense if the number of deals you need to manage simultaneously is fewer than 10, or if you’re just starting out and every dollar is on the line. The template is ready to use as soon as you download it or save it to your Google Drive. Simply plug in your contacts’ names, sizes of potential deals and what stage they’re in, and you’ll get a quarterly sales forecast as a result. You are welcome to set it up as a monthly forecast instead, and you can add or remove columns and tailor this sales pipeline template for your needs. What do you want to do with your contacts? Now it’s time to start taking action. A key thing to remember is that you cannot control the outcomes, the only thing you can control is the activities you do day-to-day. By correctly managing and focusing on sales activities, you’re likely to be more successful at making your sales goals. Reach out to contact — Commonly categorized as “prospects,” which means that this person has not been contacted yet and the relationship is very early or non-existent. Start the conversation — This group of people are people you’ve contacted. You’ve called or emailed them already and now you want to stay in touch looking for the opportunity where it makes sense to have a meeting. Meet in person — The contact has agreed to meet with you, indicating some level of interest as they are committing their time to you. Give some advice on preparation and confirm time, date and method of contact.. Send the proposal — After one or a few meetings, there may be an opportunity to formalize the conversation into a proposal to purchase your product. Close the deal — This is what you’ve been waiting for; it’s time to finalize the commitment between you and the buyer. Check back later — Not everyone is ready to buy when you reach out to them. It doesn’t mean they’ll never be ready, so it’s OK to check back with them later. If you did sell, it’s always worth checking in to see how they are progressing, and if they need another service or product from you, you’re ready to upsell or cross-sell what they need. Think about what questions a potential customer would need to have answered or which actions they would require you to take next before committing to a sale. Add this as a next activity column in your spreadsheet to keep track of where you are with each conversation. And if you need more ideas on how to determine activities, check out our guide to activity-based-selling. Once you have things going, you may see that some conversation types happen consistently. You need to decide whether these regular occurrences lend themselves to being sales stages in your pipeline. For example, if you are a real estate agent, you may want to add a “reassure buyer” column, if you face a lot of nervous buyers, and include that as a more formal stage in your pipeline. Sales stages, when clearly defined and planned, constitute your pipeline’s fundamental building blocks — and set you on your way to predicting your sales revenue with decent accuracy. 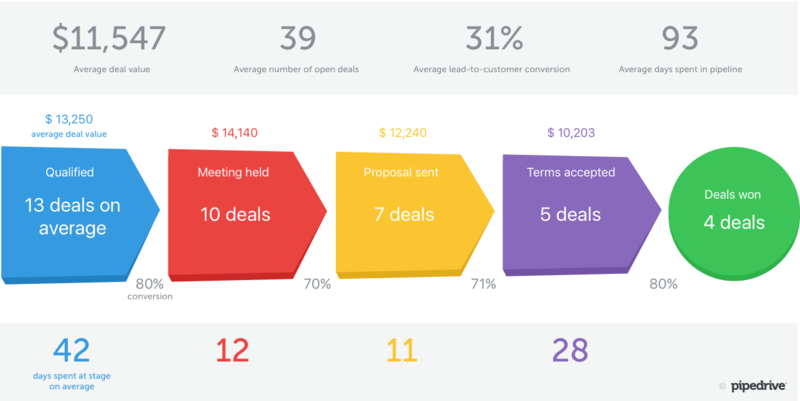 Here’s a killer lead qualification guide to help you define your sales stages. And don’t worry about getting it right the first time. It may take numerous attempts to figure out what works for your business. You’ll find that some stages end up being superfluous, as you also discover the need for stages you had previously thought unnecessary. Discuss the stages with other salespeople and colleagues. If you’re a one-person operation, ask a friend or family member. A second opinion often helps you spot flaws in your plan before implementation. Now you can start considering using a software tool like Trello, spreadsheets or even Post-it notes to practice managing these stages of your pipeline. 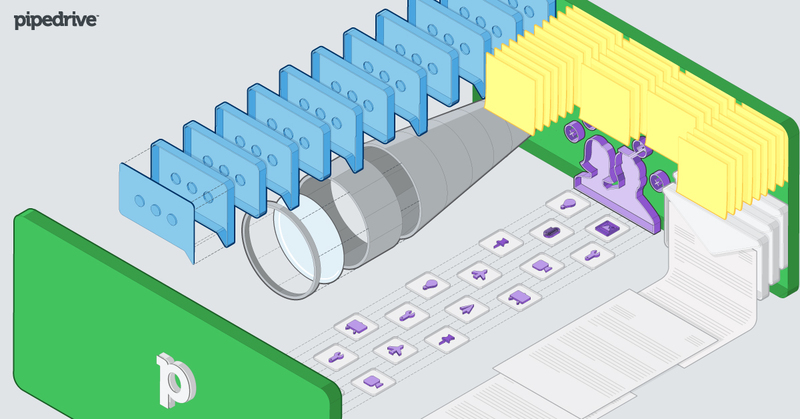 Here’s a great reference for using Trello as a sales pipeline (they call it a sales funnel). Another key discipline is to always know what the next activity is. Until someone has decided to buy (or not), continually scheduling, planning and performing the next activity are critical to success. And that’s why we consider activity-based sales the key to your sales success. Activities that add new deals to your pipeline need to be part of your routine — daily or, depending on your business, weekly. Consider how you can streamline the time you spend managing email to help you keep your pipeline healthy. How many activities do you need to do in Stage 1 to close enough deals to hit target? Can you do more? Look at where you are losing customers. Is there a stage missing from your pipeline? This is also a great time to develop the habit of moving deals through the pipeline. You need to focus on completing the activities that allow you to move the deals through each stage and onto the next. This healthy pipeline flow is essential to successful sales. This detailed guide explains activity-based selling, a methodology that will help you to push deals forward. Now that you have a healthy-looking pipeline filled with contacts in various stages of the conversation, you may be tempted to believe your business is in a perfect position. While this may be true, it’s good to clean house every so often to ensure your time is spent optimally. Consider emptying your pipeline periodically to trade hot leads with cold leads. You want make sure you are spending time on the most lucrative conversations, and that you don’t get distracted by dead deals. We know that’s hard, but sometimes it’s better to let go of deals that have been dragging on forever and focus on new ones that may be more likely to close. Once you feel comfortable using a pipeline, it will be time to graduate to sales CRM software, and it will come as no surprise that we recommend Pipedrive above all others.